To celebrate the internationalism of the school, American Pacific International School recently held an annual “International Fair 2011”. The event was held at the school’s Main Boarding Campus, on Hang Dong-Samoeng Road. Led by the school’s top management and Khun Bua Palarit, the School’s License Holder, honorable guests, parents, staff, teachers, and students all attended to inaugurate this joyful event. Photo shows (from left to right): Joining in to commemorate this celebration included Khun Panthip Kolyanee, Director of American Pacific International School (Main Boarding Campus); Thiphakorn Siripattanaponse, Director of Private Schools Promotion Group, Chiang Mai Educational Service Area 4; Vitoon Moolla, Deputy Director, Chiang Mai Educational Service Area 4; Mr. Ross Hall, American Pacific International School’s Headmaster; Khun Ladda A. Mahidi, Director of American Pacific International School (Kindergarten); Khun Bua Palarit, American Pacific International School’s License Holder; and Khun Ladda A. Mahidi, Director of American Pacific International School (Kindergarten). The Government of Japan, under its Grant Assistance for Grassroots Human Security Projects Scheme (GGP), is providing funds amounting to 3,558,500 baht for “The Project for the Construction of Dormitories for Students at Wiangphawittaya School in Mae Suai District, Chiang Rai Province”. 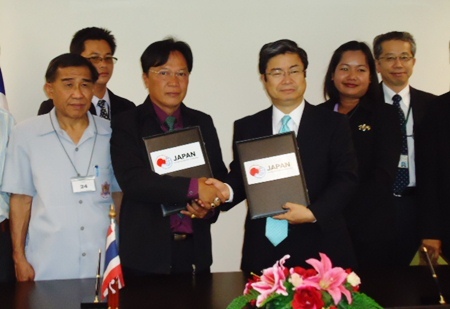 On February 10, 2011, Mr. Kazuo Shibata, Consul-General of Japan in Chiang Mai, and Mr. Uthai Srimun Director of Wiangphawittaya School, jointly signed the funding contract for the project at the Consulate-General of Japan in Chiang Mai. Under the 15-year free education policy, the Thai government is committed to reducing financial burdens on households for basic education starting from the pre-primary education level to the upper-secondary education level. However, in mountainous areas, there are some communities where no school is located within walking distance for children, and some communities where transport to schools is limited. Students living such remote areas have to stay in dormitories near or at schools to attend school everyday. Wiangphawittaya School is a public school which has set up a branch school, covering from pre-primary to lower-secondary education and serving 827 students. Almost all students are children from minority families, such as Lisu, Akha, Karen, Lafu and Yunnanese Chinese. The School is willing to accept children from minority families and households living in poverty not only from Mae Suai District but from other districts in Chiang Rai Province. As a result, the number of students is gradually increasing year after year. However, since the School is located in a mountainous area 20 kilometers from a main road, and the way to the School is an unpaved winding track by a mountain stream, many students cannot go to school and return in a day. Currently, more than 400 students, almost half the total, stay at 20 simple and small-scale dormitories at the School. However, it is not an appropriate living and learning environment, since it is overcrowded, and the capacity of the dormitories has been exceeded. The research group of the Associated Medical Science Faculty, KKU expanded its research work to work with Chiang Mai University (CMU) when they invited Ajarn Dr. Dolrawee Leelarungrayap, lecturer of the Physical Therapy Department, the Associated Medical Sciences, Chiang Mai University to exchange her extensive experiences with KKU staff on her research work on the physiology of exercise and exercise biochemistry. Assoc. Prof. Dr. Wichai Eungpinitpong, the vice chairman of the KKU research group, and Assoc Prof Dr. Yodchai Boonprakorb greeted the visiting CMU scholars. KKU students studying for their Masters and PhD’s in the physiology of exercise and exercise biochemistry also met with the visitors to discuss their work. Ajarn Dr. Dolrawee Leelarungrayap has applied to be a member of the KKU’s research group for back, neck, and muscle pain in the field of physical therapy, Faculty of Associated Medical Science, KKU. The meeting was hoped to increase close cooperation between KKU and CMU. There will be an IELTS free pre-test at the Chiang Mai Hills Hotel on Saturday, February 26 and Saturday, March 20 from 9 a.m. to 12:15 p.m. Interested students should email their full name in English, phone number and desired date for testing to [email protected] The test will cover listening, reading and writing and should be a very valuable tool for those students interested in taking the IELTS. In celebration of its 10th anniversary, the American Pacific International School (Kindergarten) hosted a birthday celebration for parents, staff and students at the school campus, World Club Compound. 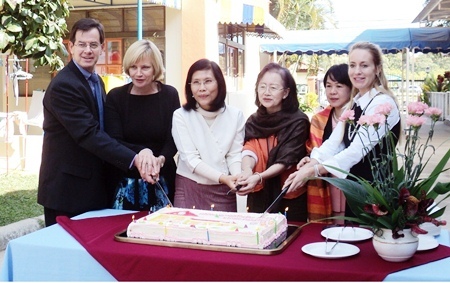 Led by the school’s leadership team and Khun Bua Palarit, the school’s License Holder, parents, staff, teachers, and students all joined in for this cake cutting ceremony to commemorate the 10th anniversary. 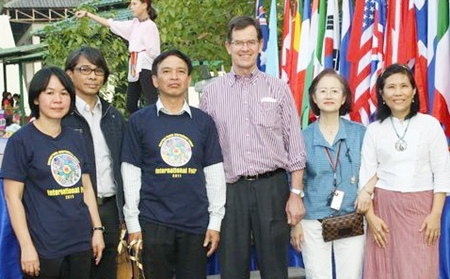 Photo shows (from left to right): Joined in this celebration included Mr. Ross Hall, American Pacific International School’s Headmaster; Mrs. Fiona Hall, Principal and Director of Admissions and Marketing; Khun Ladda A. Mahidi, Director of American Pacific International School (Kindergarten); Khun Bua Palarit, American Pacific International School’s License Holder; Khun Panthip Kolyanee, Director of American Pacific International School (Main Boarding Campus); and Ms. Amber Marie Ferry, Community Liaison Officer, American Consulate, Chiang Mai. Under the 15-year free education policy, the Thai government is committed to reducing financial burdens on households for basic education starting from the pre-primary education level to the upper-secondary education level. However, in mountainous areas, there are some communities where no school is located within walking distance for children, and some communities where transport to schools is limited. Students living such remote areas have to stay in dormitories near or at schools to attend school every day. In response to a request from Wiangphawittaya School, the Government of Japan has decided to provide funds for the construction of two dormitories which can accommodate 45 students each, one for males and the other for females. In its Education Cooperation Policy 2011-2015, the Government of Japan commits itself to support basic education to ensure all children and young people not only have access but also can complete quality education with sound learning outcomes under the concept of “School for All”. In Northern Thailand, considering the difficulties in accessing schools due to the geographical features, the Government of Japan has supported the construction of dormitories at 10 schools in Chiang Mai, Chiang Rai, Nan, and Phrae Provinces. It is expected that this assistance to Wiangphawittaya School will provide an appropriate living and learning environment for underprivileged children and ensure their continuous attendance without dropout. For more information, please contact Mr. Sato, Consul, or Ms. Hoshii, Ms. Hamaguchi, Coordinators for GGP. Consulate-General of Japan in Chiang Mai 053-203-367. 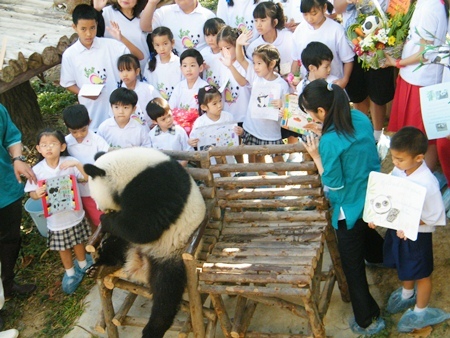 Chiang Mai Zoo organized the 20th month birthday anniversary celebration for the panda Lhin Ping panda, where a large number of students attended to offer her best wishes last month at the panda display house. Zoo Director Thanapat Pong-amorn and head of Panda Research & Display Prasertsak Boontrakulpoonthawee were joined by 20 students selected for their good deeds and good behavior for the special celebration. The children received ‘Dek Dee’ t-shirts as well as meeting Lhin Ping as a reward for their model behavior. Thanapat said the panda, who reached 20 months on January 27, now weighs 71.3 kilograms, fully grown they can weigh up to125 kilos and reach a height of 150 to 150 centimeters. The interest in Lhin Ping by students is a good model for them to gain interest and learn more about wildlife and nature.